Since the data used in my poll or in Quora did not account for international opinion, I ventured to make my own inquiry about the attitudes towards flags and national symbols worldwide. Among other things that I found there was this survey by the Reputation Institute. 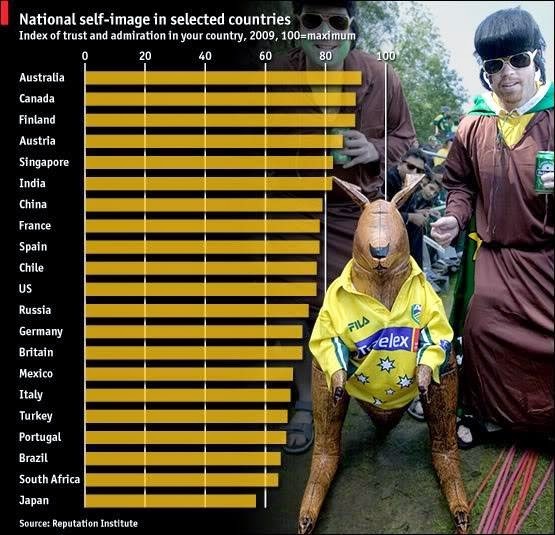 Funnily enough, India outranks both China and the USA in terms of national self-image, and the list itself is topped by Australia. Most importantly, note that none of the counties in that study put themselves below 50, suggesting that even with a perceived negative self-image, on average most people everywhere have a respect for their country. I further analysed flag culture in two particular countries - the USA and Germany. 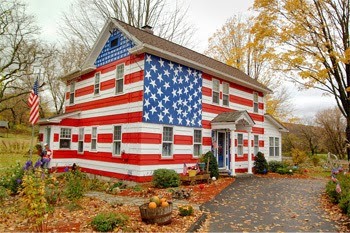 The kind of devotion shown to the US flag rivals the respect shown to many religious symbols worldwide. Yet the depiction of the flag is not exactly reverent - you can easily find the flag on a bikini as over a formal establishment. By contrast, Indians treat the Tricolour with far more formality. You can actually use flags as doormats or even burn them in protests without legal consequence. The concept of social conditioning or legal force does not seem to arise here. In Germany, we see a different picture. After the fall of the Berlin Wall, the present flag was adopted on 3rd October 1990. The colours and associated symbolism however, go back to the Frankfurt Revolution of 1848, technically making it older than our Tricolour. In Germany the use of the flag and other national symbols has been relatively low for most of the time since the Second World War—a reaction against the widespread use of flags by the Nazi Party and against the nationalistic furore of the Nazis in general. The flag is used primarily by official authorities on special occasions or by citizens during international sporting events. Indeed, Germans make a clear distinction between being "happy to be German" and being "proud to be German. As this video (start at 3:52) shows, most Germans take the former stance.